“Orchestral Works, Vol. 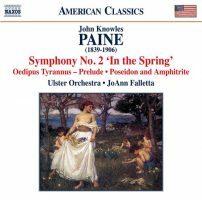 2.” John Knowles PAINE: Symphony No. 2 in A Major, “In the Spring,” Op. 34 (1879); Prelude to Oedipus Tyrannus, Op. 35 (1880-81); Poseidon and Amphitrite – An Ocean Fantasy, Op. 44 (1888). Ulster Orchestra, JoAnn Falletta (cond.). Naxos 8.559748 (1 CD) (http://www.naxos.com/). A cool treatment of overlooked repertoire. It is regrettable that late 19th-century American music is routinely ignored, or treated as a provincial curiosity, when entire generations were trained in Europe. Perhaps more zest and passion would have benefited the Scherzo (“May-Night Fantasy”) and the Adagio (“A Romance of Springtime,” whose harmonies and leaps anticipate the Adagietto of Mahler’s Fifth), although the Finale (“The Glory of Nature”) ultimately develops steam. The Prelude for the play Oedipus Tyrannus and the Ocean Fantasy are more developed statements, suggestive of Berlioz or Liszt. The eight-minute lyric Prelude tosses and turns. Boris LYATOSHYNSKY: Symphony No. 1, Op. 2 (1917-19); Grazhyna – Symphonic Ballad, Op. 58 (1955). 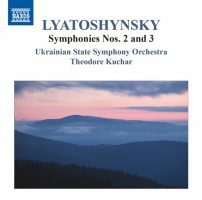 Ukrainian State Symphony Orchestra, Theodore Kuchar (cond.). Naxos 8.555578 (1 CD) (http://www.naxos.com/). Boris LYATOSHYNSKY: Symphony No. 2, Op. 26 (1935-36; rev. 1940); Symphony No. 3, Op. 50 (1951; rev. 1954). 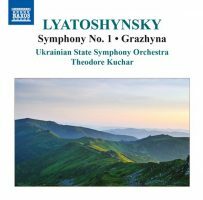 Ukrainian State Symphony Orchestra, Theodore Kuchar (cond.). Naxos 8.555579 (1 CD) (http://www.naxos.com/). Boris LYATOSHYNSKY: Symphony No. 4, Op. 63 (1963); Symphony No. 5, “Slavonic,” Op. 67 (1965-66). 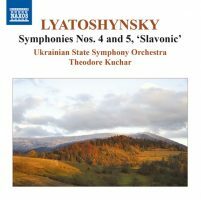 Ukrainian State Symphony Orchestra, Theodore Kuchar (cond.). Naxos 8.555580 (1 CD) (http://www.naxos.com/). Lyatoshynsky’s five encapsulate an arc that we have learned is not uncommon to innovative composers of the Soviet states. We may be more familiar with Prokofiev and Shostakovich, but this Ukrainian master’s symphonies imply a parallel confrontation with authority. No. 2 went into the drawer immediately after it was written, and committee-suggested “improvements” were required for No. 3’s finale. But once upon a time, Lyatoshynsky could be Romantic, as No. 1 proves, demonstrating admiration for Tchaikovsky and reflecting the composer’s studies under Glière. Lyatoshynsky could also be ironic, but instead of leaning towards an acidic style like Schnittke or Shostakovich, he took up an innocent mien, following Nielsen’s model, demonstrated with the folk music in No. 5. These performances were made in 1993-94. They are enthusiastic, but with a tendency towards a booming, almost heroic reverb especially when the full brass is uncorked. As a series, this may seem esoteric, unless you’re determined to understand 20th-century Soviet music. Each disc happens to represent a different slice of Lyatoshynsky’s style. As a set they make sense, although it might surprise to hear the expressive tonality and shifting orchestration of No. 4 after the Romantic First. The descriptive Grazhyna isn’t a complete surprise after No. 1 because its growling idée fixe reflects its composer’s steadfastness. Emil Nikolaus von REZNICEK: Symphony No. 3 (1918); Symphony No. 4 (1919). Robert-Schumann-Philharmonie, Frank Beermann (cond.). cpo 777 637-2 (1 CD) (http://www.cpo.de/). 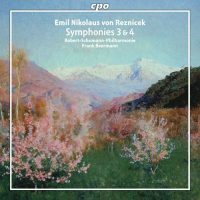 Cpo concludes its Reznicek series with two contrasting symphonies that demonstrate the composer knew his way around the kitchen. The cheery Third provides Schubertian touches and an expert Haydnesque Minuet-Trio including wrong notes and chords, pre-empting all Neo-Romantics. No. 4 takes a different tone, soberly pondering Wagnerian pathos. Here Reznicek could be mistaken for an uncomplicated Richard Strauss. The second movement bears the heading, “Funeral March on the Death of a Comedian.” Transplant the title across country borders and it astonishes to realize how shrewd contemporary Soviet composers would become. Reznicek pays his respects, but never lingers or gushes. The scherzo continues the Beethoven vein, and a competent variation series provides a finale. Symphony No. 1 was covered here and Nos. 2 and 5 here. Edward Burlingame HILL: Divertimento for Piano and Orchestra (1926); Symphony No. 4 in E-flat Major, Op. 47 (1940-41); Concertino No. 1 for Piano and Orchestra, Op. 36 (1931); Concertino No. 2 for Piano and Orchestra, Op. 44 (1938-39). 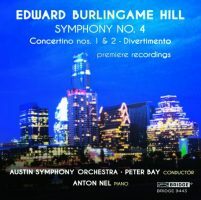 Anton Nel (pno), Austin Symphony Orchestra, Peter Bay (cond.). Bridge Records 9443 (1 CD) (http://www.bridgerecords.com/). Bridge opens a window onto forgotten American music from the first half of the 20th century. Hill studied with Paine at Harvard, and after working with Widor in Paris, returned to Cambridge, MA, to join Harvard where he taught many including Piston, Thomson, Carter, Sessions, Fine and Bernstein. These pieces demonstrate a relaxed competency (absent from most of the aforementioned students) including an occasional jazz foray. A Gallic sensibility is also evident in efficient melodies and a disinclination to ramble. The concertante works are single movements, just slightly larger than trifles. The Divertimento overtly gambols with jazz, and the later first Concertino’s modal opening reminded me unexpectedly of Pilati and Malipiero. Symphony No. 4 ambles along, pointing out details and effortlessly tidying up after itself. In three movements, it suggests the film scores to the screwball comedies of the same period. There could have been further, perhaps more inquisitive development of its folksy tunes. Regardless, we should hear Hill’s first three. 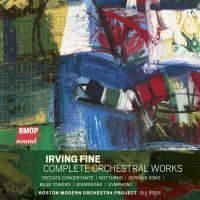 Irving FINE: Toccata Concertante (1947); Notturno for Strings and Harp (1951); Serious Song, A Lament for String Orchestra (1955); Blue Towers (1959); Diversions for Orchestra (1960); Symphony (1962). Boston Modern Orchestra Project, Gil Rose (cond.). BMOP/Sound 1041 (1 SACD) (https://bmop.org/). Fine’s collected works for orchestra reveal a trajectory cut short (1914-62). We start with Stravinskian Neoclassicism in the Toccata Concertante and pass through the urbane populism of Blue Towers to voluptuous serialism in the three-movement Symphony. The Notturno hides the harp in the central Animato which suggests a more clever and impish personality than shown in the surrounding Lento and Adagio. Serious Song offers darker harmonies, a cross between Tchaikovsky and Barber. Leonard Bernstein, a close colleague, found this to be his favorite Fine work. Given their sparkling palettes, it does not surprise that Blue Towers and Diversions were premiered by the Boston Pops (under Arthur Fiedler in the former, and led by Harry Ellis Dickson on a children’s concert for the latter). The program concludes with the Symphony, a culmination of Fine’s art. He used serialism, but the curvaceous atonality and fluid rhythms suggest both Gerhard and Dutilleux, but more interestingly, a path not often taken in American music. 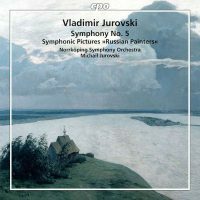 Vladimir JUROWSKI: Symphony No. 5, Op. 79 (1971); Russian Painters (1957?). Norrköping Symphony Orchestra, Michail Jurowski (cond.). cpo 777 875-2 (1 CD) (http://www.cpo.de/). In three hefty parts, Jurowski’s Fifth peddles irony. Completed just months before the composer’s death, it is hard to imagine that the continual sequencing of conservative Soviet styles and textures was not done intentionally. Most of the work is lush tonality, presumably an extension of the many film scores Jurowski produced over a lifetime. However, there are flashes of dissonance and what-if moments as if Shostakovich or Prokofiev had taken easier, tonal paths. On the whole, Jurowski’s style and motivic developments suggest Franck. The last movement’s liveliness sounds like Dukas, up until the absurd victorious ending which adds emphatic organ only to sound hollow. Russian Painters is a compact sequence of seven tone poems that could be Romantic outtakes by Kabalevsky or Shostakovich. Only one of these sketches exceeds five minutes. Cpo crops the first for the booklet cover, but the remaining six are reproduced in their entirety although in black and white. One of them, No. 3, Ivan Kramskoi’s 1883 Portrait of an Unknown Woman was the cover of cpo’s release of Rott’s Symphony (cpo 999 854-2). This release is conducted by the composer’s son, whose own son, also Vladimir Jurowski, is a conductor as well. 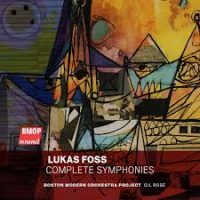 Lukas FOSS: Symphony No. 1 in G (1944); Symphony No. 2, “Symphony of Chorales” (1955-58); Symphony No. 3, “Symphony of Sorrows” (1991); Symphony No. 4, “Window to the Past” (1995). Boston Modern Orchestra Project, Gil Rose (cond.). BMOP/sound 1043 (2 SACDs) (https://bmop.org/). Foss rolled forwards and backwards all at the same time. Comfortable with many styles, his four symphonies spanning a half-century pulse with remarkable consistency. It is easy to confuse one with another, and this bundling (1 then 4, 2 then 3) contributes to the kaleidoscope. Perhaps each could have been etched more distinctively, but having consistent performances of the tetralogy sets a high standard to follow. No. 1 fits well among the bursts of broad and bright American music that we now attribute to Copland, but it wants more, pushing at the edges, with complex massing that looks forward to Carter and sturdy tonal pileups that recall Mahler. The Chorales symphony flirts with Bach from different angles. The opening Toccata’s repeated notes and added saxophone and piano suggest Berio and Andriessen’s textures and techniques. The third movement’s gentle retrospective catches whiffs of Respighi’s Airs. The fourth movement takes up Stravinsky’s flavor of Neoclassicism with wrong-note chords and misspelled material passing across borrowed harmonies. Despite its helpful subtitle, No. 3 is the least coherent with its four brooding parts. The second movement, Elegy for Anne Frank, is a reasonably straightforward memorial that builds and fades; the third movement Wasteland stems from Eliot’s poem. The concluding Prayer hides a Neoclassical spin to Americana, twisting something that may have been Copland-nice through a gauntlet of wrong notes and dissonant smears. In some ways, Foss resembles Ives, and it is No. 4’s conspicuous mélange which recalls the elder American’s own Fourth, astonishing for the prof who took over Schoenberg’s job at UCLA. If Foss’s prior symphonies represented a point in time, or at least a particular compositional style of the moment, Window to the Past rummages around Neoclassicism, aleatoric shenanigans and Americana, all the while permitting folksy tunes (including one provided by harmonica!) to roost for a bit.